imprinted shadows on our souls. Björn has brought us another piece of physics to inspire our writing, and has enlightened us about the mystery of radiation. He would like us to use radiation or the stories surrounding it as inspiration for a poem. You can write about the scientists, the weaponry or uses. I think that radiation can be used as metaphor for toxic emotions. Posted in Poems. Tagged Hiroshima, Imaginary Garden with Real Toads, Physics with Björn, Poetry Pantry, Poets United, Radiation. I was tempted to take inspiration from the photo of the little naked girl running, but it’s such a well-known one, I was worried about preconceptions, so I hunted for a photograph that I didn’t know so well. Black and white photographs are so evocative. Very good choice. I think black and white photos have the weight of history somehow, no matter how recent. Speaking of the photo of the little girl, last February there was an interview with her on NPR where she talks about her life after that Pulitzer-winning photo was taken. It really puts things in perspective: https://www.pri.org/stories/2018-02-21/how-vietnam-wars-napalm-girl-found-hope-after-tragedy. It is astonishing that humans actually dropped those bombs that laid waste whole cities. I hope it never happens again. As long as men like Trump are in power, it’s a possibility, I hate to say. I can’t bear to think about war – it worries me too. Such a powerful response to the prompt, Kim! The closing image “mushroom imprinted shadows on our souls”..is poignant and will linger in my mind as I contemplate.. sigh.. The sight of certain powers will always stay with us. And few things are as powerful as the love of a caregiver. Or, the destruction of human-crafted horrors. That is so true, Magaly. I think it will happen again Kim and this action would not be confined to Trump, we delude ourselves if we think so.. It is a real fear. I think about it. I worry should it happen, I will be apart from my now grown up children. If I survived – how would I know they were okay? This afternoon I viewed (a recorded) C4’s Myanmar’s Killings Fields and this brought home to me what I already knew, humankind easily slips back into the primordial soup. In our hearts we are feral. Enough of this doom and gloom. I hope you are having a lovely day! Hi Kim! That image is mesmerising. Love in the midst of chaos. You described the devastation perfectly with that phrase..’ life leeched from..’. Made me think. Hi Viv! I thought I’d check messages and comments before I go to bed and there was one from you! Hope you’ve had a good weekend. I gave up on marking to watch The Handmaid’s Tale. 😊 Good night and I’ll see you on the poetry trail. Powerful and chilling. I do hope that we are not on this trail again. The imagery in the poem combined with the picture really tell it all! There’s a similar photograph that was taken in one of the death camps – love always shines through. A mother can anticipate and be a step ahead in most instances! Nothing to be proud of here. You can see the sadness in their faces…. Powerful writing and the devastation in those faces breaks my heart. So bittersweet. Mother’s love is grace but not an antidote. 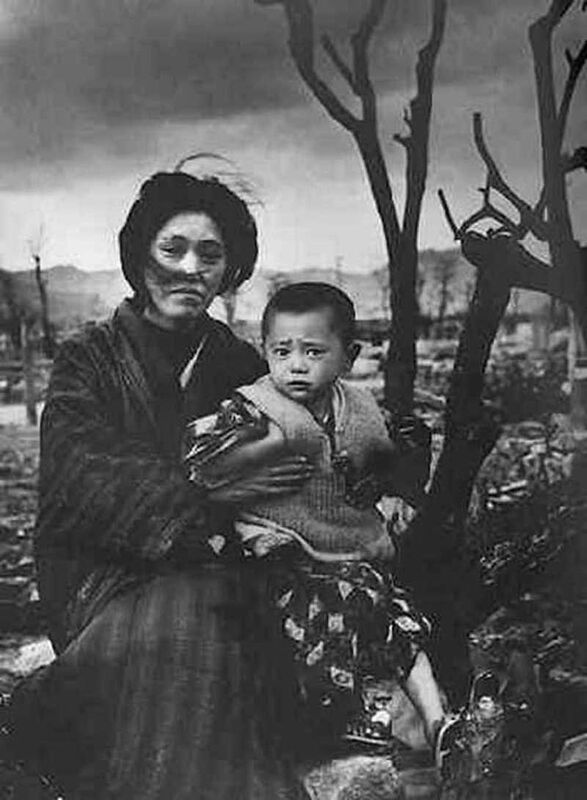 Most horrific act of humankind… just being in the Hiroshima memorial leaves one numb. And yet, the stockpiles grow. It’s a huge concern. You would hope that so-called intelligent beings would learn from history but they never do. Yes it is worrisome… only takes one extremely stupid moment….the world needs a reboot on this whole war thing. A beautiful ekphrastic poem, Kim. That picture is haunting! And I love the hope of a mother’s love in the face of devastation. Beautifully written, brilliantly understated … and how sadly ironic.